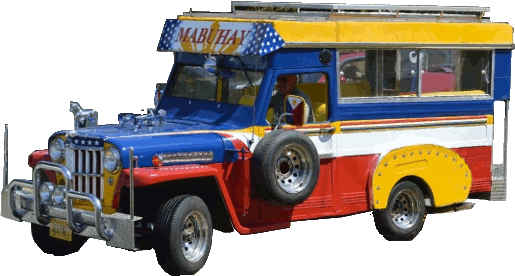 On this site you'll get to discover the unique treasure that is the Philippine Jeepney, and learn about the few examples that exist in the United States. We'll also link to different Filipino-American cultural groups. You'll also get to 'ride along' as I follow in the footsteps of the original Jeepney makers, as a 1963 Willys Wagon is transformed into a Jeepney. Mine will be a bit different from the traditional jeepney, as I live in the Pacific Northwest where it is cool and rainy most of the year. My jeepney will definitely have windows and doors, similar to Baguio jeepneys, but will still be in keeping with the Filipino style. The latest on the first US made jeepney can be found in our blog.